OK, so I know I was pretty cagey about not posting any pictures of these while they were in progress, but really, they're nothing to crow about. Or write home about. Or whatever other cliche you want to fill in that particular blank. But I figured since they were such a topic of [my] conversation for so many months I may as well post a picture--albeit showing as little of each of them as possible. To recap: someone donated a plethora of 5x7" rectangles to our church--that's not as random as it might seem but it's a long, uninteresting story that I don't want to bother going into. Suffice it to say, we hadn't asked for them. 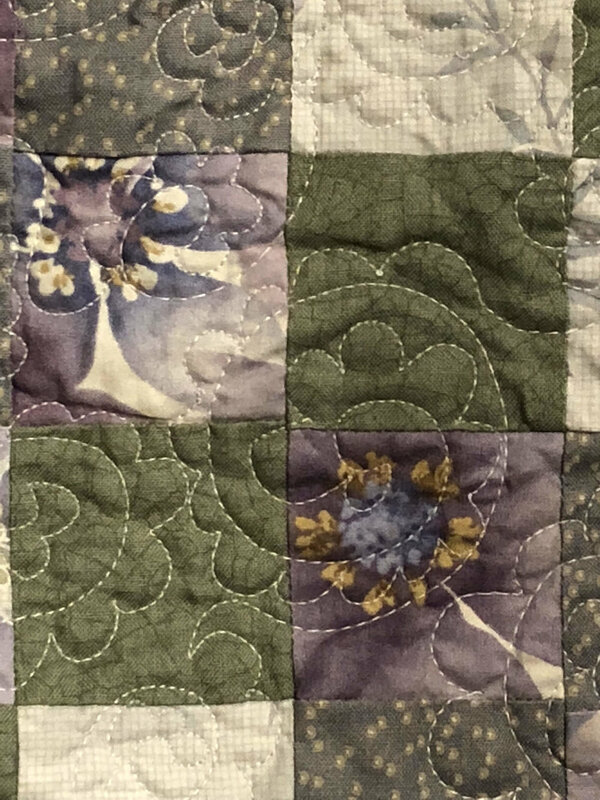 But we wanted to honor the intentions of the donor so I asked another woman (poor thing, she's a brand new quilter) if she'd be willing to piece the tops and I'd finish them off. 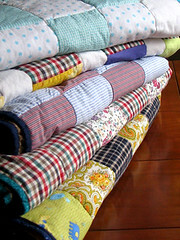 She got a friend or two of hers to help her do it, and they managed to figure out how to put this very odd conglomeration of fabrics into sets that were something approaching coordinating. I believe they added in some of their own fabrics here and there as necessary. They pieced the tops and then handed them over to me. 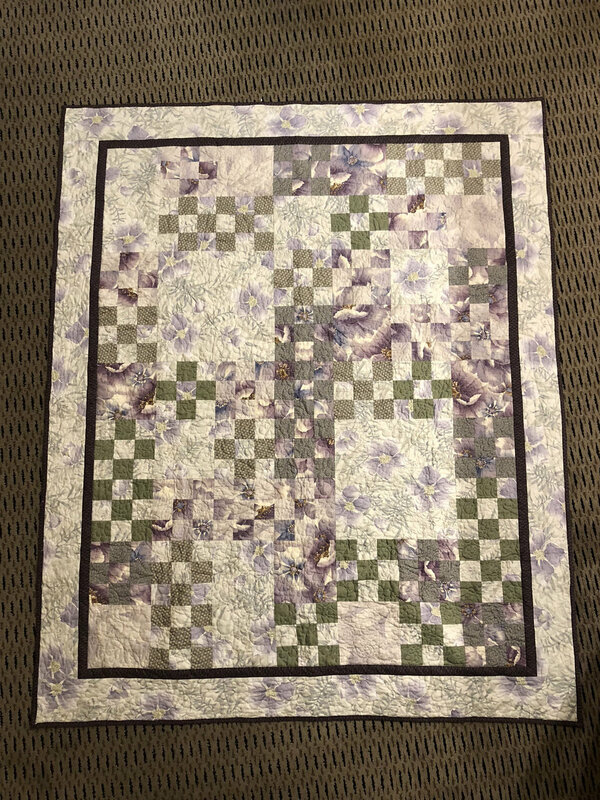 I then did the backing, quilting, and binding. Some fast facts: the one on the bottom was Evil. With a capital E. It was the first one and just about made me want to go home and throw out the rest before even starting on them. 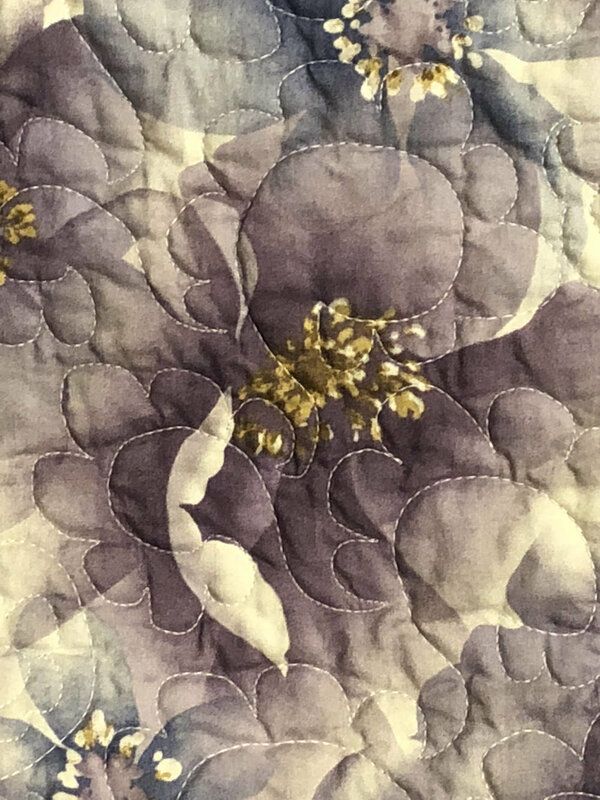 However, it's malevolence was most likely due to the fact that the fabric I used for the backing (inherited from Mom) was actually sort of a heavy brushed cotton--almost flannel--that seemed all warm and cozy but made it insanely heavy to work with on my sewing machine. Also, I was working on it at a quilt retreat so was using my plexiglass table extender for the machine rather than my usual recessed sewing cabinet, so it kept dragging and catching on the edge of the plexiglass. In short, it was a major pain in my...well...you know. The flip side of all that grief was I was pathetically glad about how quickly the rest went in comparison. 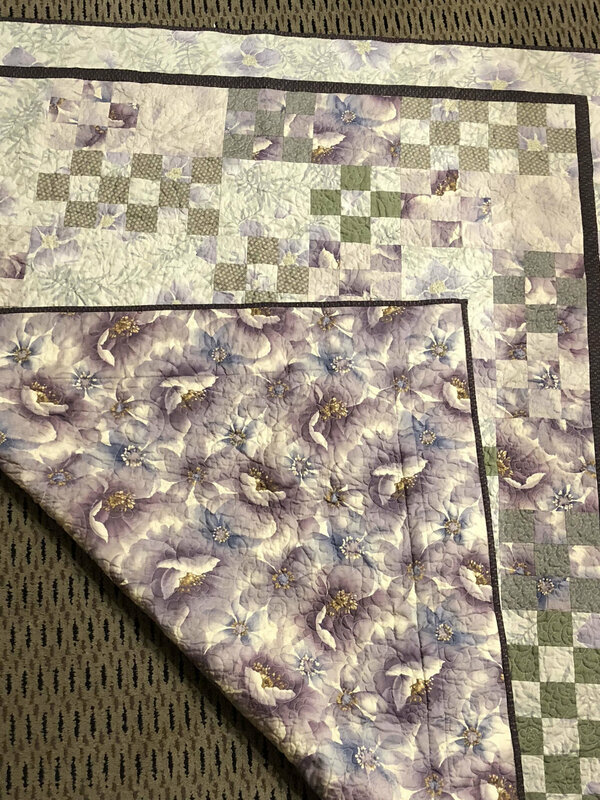 All the backing fabrics I used were inherited fabrics; numbers two and three from the top have the same backing, that doesn't match the front at all but again is a fairly soft cotton that should be comfy. Numbers two and four are the ones that share the same binding (the "extra 198 inches" inexplicable math error). The one on top is the only one I actually like--it's kinda cute! I bled on the back of one of them. The stain came out, but it seemed somehow fitting. I just finished dropping them off at the donation site. I'm not sure the volunteers there understood why I gleefully skipped back out the door to my car. "Buh-bye!"